Israel reportedly bombed an Iranian airplane delivering weapons to Syria at the Damascus International Airport on Saturday, as well as weapons storage rooms at the airport, in the latest round in of conflict between Israel and Iran. The Times of Israel—citing Hadashot TV news, Syrian media and the Syrian Observatory for Human Rights in their report—said the arms cache near the airport had been intended for either Iranians or Hezbollah. The warning from Israel’s leader followed expressions of his support for preemptive strikes in an effort to protect Israel from a more grievous war. One of the worst conflicts in Israel’s history was the Yom Kippur War in 1973, and with the Jewish anniversary of that fight coming up, Netanyahu said the failure to strike first was a critical error that would not be repeated. The Israeli leader noted that the Yom Kippur War resulted in thousands of Israeli casualties, and while war is terrible, sometimes there is no other choice. According to reports, Israel has launched hundreds of strikes on targets in Syria in an effort to prevent Iran from establishing a military base in Israel’s northern neighbor, as well as to prevent Hezbollah from obtaining advanced weapons. 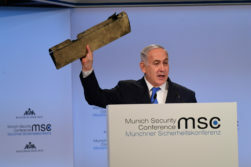 While Israel generally does not accept responsibility for specific strikes, Netanyahu regularly speaks of Israel’s “red lines” in Syria and warns against Iranian influence in the region.